I recently purchased an interesting pre-WWII custom rifle. It is a 1903 Springfield action, barreled by William Sukalle (renowned barrel-maker of Tucson, Arizona) in 7x57mm Mauser, with a stock by the legendary Adolph Minar of Fountain, Colorado. 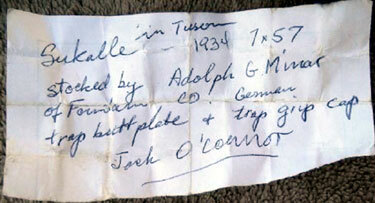 Jack O’Connor once owned a Minar-Sukalle rifle in 7×57. 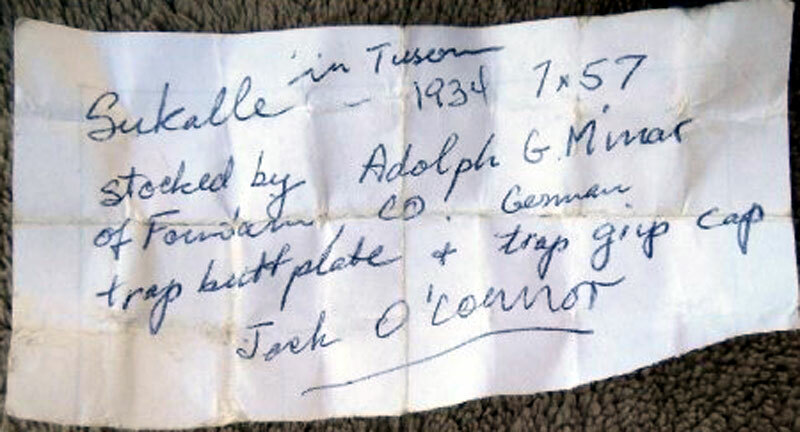 The one I bought isn’t his, but there is a note signed by Jack O’Connor describing the rifle, tucked away in the trap under the pistol grip cap. Minar died young in 1936 at the age of 56, and is believed to have stocked a total of 36 rifles. O’Connor owned more than one of them. Phil Shoemaker today has Jack O’Connor’s Minar .30-06. 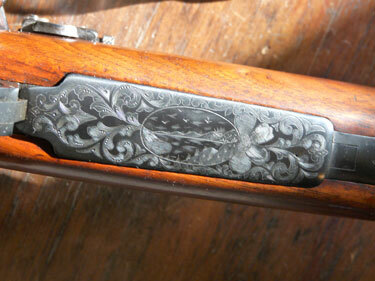 The Shoemaker rifle was previously given by O’Connor to Sports Afield Camping editor John Jobson, who wrote about it. George R. Farr’s Springfield, now in the National Firearms Museum. After the light had already gone bad, but before Adkins had finished his string, a man whose thick silver hair betrayed a life longer than three-score years, walked across the field to the Wimbledon firing line. His khaki shirt and dungarees bore no team insignia. As he carried a modest improvised shooting bag and his rifle to the firing point, he appeared to be only one of the many old fellows whose team mates instinctively christen “Dad.” But the shoulders of his angular body, the glint of his bright blue eyes, surrounded by those tiny wrinkles that are penciled on the faces of outdoors men from gazing overlong at great distances and the firm, smiling mouth under the close-cropped mustache, might have given a hint to anybody who chanced to notice him that he was not the ordinary old-timer who turns up at National Matches now and again, never to finish in the money and seldom to reappear. The squadding card from which the Range Officer called his name identified him as George R. Farr, of the Seattle Rifle and Revolver Club, and a member of the Washington Civilian Team. His age, of course, was not on the card. Later it was learned he is sixty-two. He had joined the team fresh off the trail in the Olympic Mountains. Many of the throng who had watched Adkins while he ran his record-breaking score had drifted away; the few who remained took little heed of him when he drew five clips of Frankford Arsenal ammunition and lay down at the peg, opening his shooting bag and taking therefrom as meager a shooting outfit as could be imagined—a “Mike,” a pair of steel-rimmed nose glasses—far-sightedness is a characteristic of his vision—and the strangest spotting scope that could be imagined; one barrel of a cylinder field glass that had been cut apart with a hack saw. The old blue eyes peered down the range from under the brim of a black slouch hat, and Farr knowing nothing of the elevations required by the rifle he was using—he had drawn it that morning to replace another that had “gone bad”—estimated his sight settings from those he had used on the 600-yard range from which he had come. As a matter of cold fact, he sighted in his rifle for 1,000 yards with the two sighters permitted in the Wimbledon conditions. “Dad” Farr, from the Olympics, fired his first sighter at 4:30 p.m. Through his sawed-off glass, the spotter showed a Three. He perched the steel-rimmed glasses on his nose, took his “Mike” and made an adjustment, removed his glasses and fired. This time the spotter showed stark against the black of the bull, and his first record shot followed it. When five bullets had sped down the range, Farr jammed in another clip with no more concern than if he had been shooting a string of rapid-fire and continued shooting. Nineteen record shots had found the black when Farr seemed to grow a bit nervous. His later explanation of this circumstance, in the light of what followed, is particularly interesting. Then to the unfeigned surprise of the range officer, “Dad” Farr rose from the firing point and started away. “Wait a minute; keep on firing,” the Range Officer called. “Here are some,” the Range Officer said, offering two clips. “I reckon one of them will be enough,” the old man replied as he climbed back into his sling, jammed in another clip and lined his sights again on the target. From then on, George Farr from Seattle, disregarding every known range custom—firing from the magazine instead of loading singly, moving his elbows from their position, now and again hunching his body into a more comfortable position—continued to hang up bull’s-eyes while an astounded gallery gathered behind him, and the Range Officer was kept busy finding ammunition for him, for Frankford Arsenal issue stuff had not been overly popular with the shooters in this match wherein the 180-grain bullets were permitted. His group kept growing, creeping across the target from left to right, and sometimes climbing a bit as the keen old eyes fought the darkness. Although Farr shot as rapidly as he could—the frequency of his shots being remarkable, considering the range—he did not get quick service at the butts. If he had, it is possible that a different story would be told. Between shots, like Jones during his Wakefield run, Farr frequently rested his head on his arms. Until he had fired his sixtieth shot, the light was fairly good; then it rapidly began to die away. After the 65th shot, the light was very bad. On the 66th shot he began holding down on the butts, with added elevation, but this device served him in the fading light, for only four more bulls. His 71st shot was a Four, and the most remarkable of all service-rifle-and-service-sight records was completed. It was 6:10 p.m.
the Archives of Never Yet Melted in the '1903 Springfield' Category.